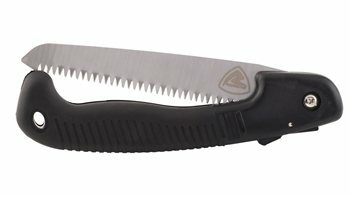 A light and compact folding saw. This saw cuts green and dry wood and wil also cut plastc. The two component plastic handle gives a perfect grip. The saw is equipped with a safety lock for both lock in and lock out. The blade is 18cm in length and has a corrosion resistant finish. Our new range has been developed to address base camp comfort and the growing demand for accessories that has a heritage in that used by those early American prospectors and pioneers whose spirit is captured in evocative sepia photographs. Quality traditional materials and designs have been integrated into the Robens portfolio of technical products to complement our Outback tipis and Prospector tent. Every product in this exciting range is perfect for wilderness cooking over an open fire and includes tripod, cast iron Dutch ovens and steel pots, skillet, griddle/stand and kettle, and enamel tableware. Useful tools are supplied in the form of axe, saw and kit for food preparation, and more.